ISTANBUL, Jun 8 2014 (IPS) - The half-built Metsan Nexus complex towers over Istanbul’s Kartal district, just one of dozens of massive, high-end, multi-use development projects that are transforming the city’s skyline. On May 31, three men were working outside the building’s 16th floor when the construction scaffolding beneath them gave way, sending them plummeting to their deaths. “The scaffolding does not collapse spontaneously, when it is erected properly. The workers do not crash on the ground, unless there is lack of safety precautions,” urban researcher Yaşar Adanalı wrote following the incident in a scathing post on his Reclaim Istanbul blog. Worker safety issues in Turkey’s mining industry have been the subject of a national outcry following the mid-May deaths of at least 301 workers in one deadly incident in a coal mine in Soma, a town in western Turkey. But the country’s construction sector, which has been a key driver of Turkey’s economy as it boomed over much of the last decade, is no less perilous for workers. “Construction workers [in Turkey] face hard and dangerous working conditions, with very long work hours, insufficient usage of protective equipment, and low salaries,” says Dr. Ercan Duman, an occupational physician and member of the Istanbul Occupational Health and Safety Council. He identified “falls from height” as the leading cause of worker death on Turkish construction sites and “being struck by objects” as the top source of injuries. According to the Istanbul-based advocacy group Worker Families in Pursuit of Justice, many fatal falls happen because proper mechanisms for attaching safety harnesses are never installed, forcing workers to clip and unclip themselves to the scaffolding as they move around the building. Turkey’s construction sector accounted for 34.4 percent of worker deaths – 256 out of a total of 744, the most of any industry – in 2012, according to data from the national Social Security Institution; construction ranked third, after the metal industry and mining, in terms of workplace injuries. The Turkish government has touted its progress in reducing workplace deaths. Speaking at the 7th International Conference on Occupational Health and Safety, which Istanbul hosted in early May, Labour and Social Security Minister Faruk Çelik pointed out that the Turkish workforce had grown by 128 percent between 2002 and 2012 and the number of new workplaces by 111 percent. “Despite these increases, the number of fatalities per 100,000 workers has decreased from 17 to 6,” Çelik said. That number is still significantly higher than the EU15 average of 1.5 fatalities per 100,000 workers, and workers’ advocates in Turkey say death and injury rates are underreported due to the large number of unregistered workers – who make up an estimated 30 to 40 percent of the country’s total workforce – and the growing prevalence of subcontractors, who now account for more than 1 million workers. “The widespread use of labour subcontracting [in Turkey] is one of the reasons for the decline in workplace safety, as subcontractors fail to provide the necessary training or equipment to workers and refuse to observe occupational health and safety measures in the workplace,” says Makbule Sahan, a Human and Trade Union Rights Officer at the International Trade Union Confederation (ITUC), which ranked Turkey among the world’s worst countries for workers in its Global Rights Index 2014. Thirteen subcontracting firms employ approximately 2,000 workers at the Maslak 1453 project site, another luxury multi-use development currently under construction in Istanbul. A worker employed by one of these subcontractors died there on May 27 after being hit on the head by a piece of iron. Fellow workers told Turkish press outlets that an ambulance was not standing by at the site as required, and that netting was not in place to catch falling objects [or persons]. Work has continued on the Maslak 1453 site despite a court order in April ruling that it should be halted over environmental concerns. The project’s owner, construction mogul Ali Ağaoğlu, was called in for questioning in December as part of a sweeping probe alleging widespread corruption in the building sector. Ağaoğlu, who was released without charge, has become one of Turkey’s richest men over the country’s decade-long building boom, which has seen nearly 600 billion dollars invested in new construction, and the land area approved for building projects increase by almost fivefold, according to a Bloomberg report in January. Turkish prime minister Recep Tayyip Erdoğan has repeatedly vowed to make the country one of the world’s top 10 economies by 2023. But that emphasis on rapid growth comes at a cost, according to researcher and activist Demet Ş. Dinler. “[Turkey’s current] model of growth based on construction has triggered further dangers in terms of health and safety [due to] the speed of construction and a desire to reduce costs in a competitive environment,” says Dinler, a PhD candidate in the Department of Development Studies at the University of London. “Health and safety is the responsibility of the main employer but the fragmented structure of the work process makes it difficult to check whether measures have been taken and apply to all workers on the site,” she adds. Although Turkish labour law obliges employers to “provide for the work-related health and safety of workers,” Dinler says there is “little incentive for employers to take the necessary measures” due to the lack of enforcement mechanisms or serious legal sanctions for non-compliance. Unions that might have pushed for stronger protections have seen their right to organise and strike limited further over the past decade and their membership numbers have dwindled by 40 percent. Even when workplace deaths occur en masse, fault-finding investigations proceed slowly, according to the Worker Families in Pursuit of Justice. 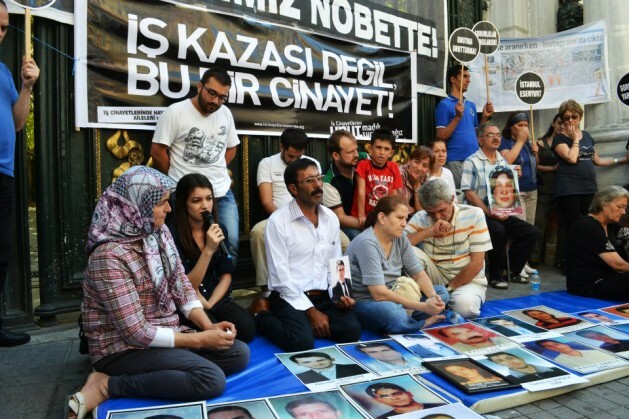 Members of the group have been holding monthly vigils in central Istanbul for two years, displaying photos of lost loved ones such as the 11 workers killed in March 2012 when a fire broke out among the dormitory tents where they were living on the construction site for the Marmara Park shopping mall in the city’s Esenyurt district. According to Dinler, the use of tents as worker housing was prohibited after this deadly blaze, but a report by the Association of Construction Workers found them still in common use a year later, and frequently overcrowded and unsafe. And although inspectors from the Labour and Social Security Ministry identified various safety violations at the Esenyurt site, including an improperly installed electrical system and a lack of emergency exits or fire-fighting equipment, no one has yet been held legally responsible. An expert report presented at a new court hearing this week on the incident suggested that the workers bore “secondary responsibility” for their own deaths because they had stacked up foam mattresses on a bed next to the tent’s only doorway, impeding their exit when the fire broke out.